Do you know how fortunate we are? We have food to eat, clothes to wear, and a house to live in. But there are millions of unfortunate people in this world. They don’t know when their next meal will be. They don’t have a place to rest, nor a place to take a shower. You might have come across one in your daily life. The next time you see one, please help out to the best of your ability. IBS has been helping the homeless for many years. There had been many generous people who had supported this program. 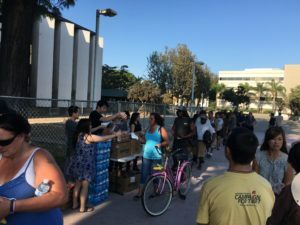 In California, IBS fed many homeless brothers and sisters in the San Diego Downtown, Santa Ana, Los Angeles, Fresno, San Jose, and Stockton. On Saturday, under the guidance of Ven. 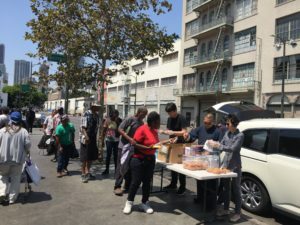 Xian Zhong, we went to Skid Row, Los Angeles, and Santa Ana to feed our homeless brothers and sisters. 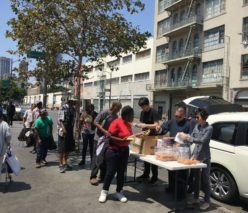 We were able to feed about 350 street brothers and sisters. IBS would like to thank Jake, Rich, Lisa, Barbara, Patrick, Elaine, John, Sean, Terri, Lie Ly, and Winston for helping us feed them. Thank you especially to Lie Ly and Winston, they were with us the whole day to help feed those homeless brothers and sisters. We had a very fruitful day with these kind people at Skid Row and Santa Ana. IBS really appreciates your time and support. Hope we can do this more often. Skid Row in Los Angeles is one of the places where thousands of homeless brothers and sisters live. It is very saddening to see all those people living in shabby tents on the sidewalks. The whole street has a lot of garbage, and an unpleasant smell permeates the air throughout the area. But these are the lives of those unfortunate people. We should find the time to try help them lift their lives if possible. We know that IBS feeding them once in a blue moon will not help much. 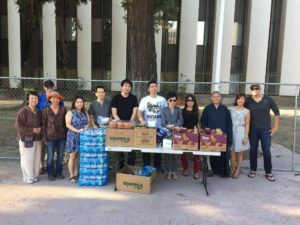 We saw that there were other organizations who fed them more regularly. Still, that is not the ultimate solution. At least these provide a temporary relief from hunger and thirst. But I wish that they get additional support from those organizations or citizens who have the potential to counsel and educate them to get out from their homeless situation. That is the ultimate help for them but we still should carry on feeding them food, water, giving clothes and shelters. The practice of loving, kindness, and compassion are very important and not only helps oneself but also benefits many others. IBS encourages people to do good deeds on their birthdays and to celebrate them in a very special and meaningful way. We can’t wait to celebrate your birthday by offering a special meal to the people on the street who need them the most. Please feel free to join us and support homeless brothers and sisters. If you want to do an offering in overseas countries, it is our honor to organize for you in Nepal, India, and Bhutan – this includes monks in the monasteries, kids in the orphanages, old age home, beggars on the streets, amongst others. Your birthday offering will make many families and kids happy and I am sure that will be a meaningful way to celebrate your birthday.